After falling into disrepair the Canal was re-opened by Her Majesty the Queen in August 1990, once again joining the River Avon in Bath to the River Thames at Reading. The Kennet & Avon starts its life at the Widcombe flight of 6 locks, of which one is Bath Deep Lock, the second deepest in England. After Bath Top Lock, the canal passes under Cleveland House, the original headquarters of the Kennet and Avon Canal Company, through Sydney Gardens and out of Bath to Claverton. The Claverton Pumping Station built in 1812 to the ingenious design of John Rennie the canal’s principal engineer. The pumping station is powered by a huge water wheel driven beam pump, turned by the River Avon, the water is pumped from the river to the canal some 47 feet above. The station has been restored by the Kennet and Avon Canal Trust and is open to the public on Wednesdays, Saturdays, Sundays and Bank Holidays from April to October. About a mile from Claverton is the Dundas Aqueduct, built in Bath Stone, designed by John Rennie and regarded as his finest work. 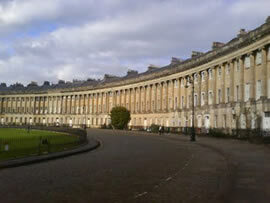 The aqueduct was named after Charles Dundas the first chairman of the Kennet and Avon Canal and was opened in 1805. Soon follows the Avoncliff Aqueduct, again designed by John Rennie, this has a larger span and stands higher above the River Avon and railway than the Dundas Aqueduct. Like the Dundas Aqueduct, this fell into disrepair and had to be drained and relined with reinforced concrete. It has now been restored to its original condition, including the addition of stonemasons carvings to compliment the original work. After skirting through Bradford-on-Avon, and passing north of Trowbridge the Canal leaves the Avon Valley and enters the picturesque Wiltshire countryside through the villages of Hilperton, Semington and Seend before approaching Devizes and the Caen Hill flight. This is a flight of 16 locks one above the other and is one of Britain’s most spectacular features on her inland waterways. 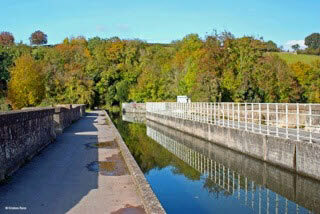 It forms the middle section of the Devizes flight of 29 locks rising a total of 237 feet over 2 1/4 miles. The Caen Hill locks were the final section of the canal to be completed in 1810 and was also the last section to be restored when the canal was reopened in 1990. In 1995 a pumpback scheme was installed capable of pumping 300,000 gallons of water a day from the bottom of the flight to the top, curing the longstanding water supply problem on the canal. The Kennet and Avon Canal Trust Centre is next to Devizes Wharf, previously called Town Wharf, the last of Devizes’ three Wharves. The water front warehouse now holds the town’s theatre and at right angles to this is the Canal Trust, holding an impressive display of canal history with a canal shop and information centre. Also a common sight on the streets of Devizes, is the local brewers Wadworth & Co still making local deliveries with a team of shire horses. 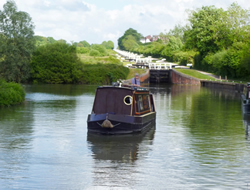 As you leave Devizes you have 15 miles of lock free cruising through the Vale of Pewsey. Passing to the north of Pewsey, the canal climes to its highest point 450 feet above sea level through the Wootton Rivers Flight. The Canal touches the edge of the Savernake Forest before entering the Bruce Tunnel descending from the Summit Pound by the Crofton Flight. Another of John Rennie’s designs is the Crofton Pumping Station, it houses one of the worlds oldest working beam engines still in its original setting, pumping water from Wilton Water to feed the Summit Pound. The former Great Western Railway line follows the canal through Little and Great Bedwyn, as it merges into the Kennet Valley at Hungerford. As you approach Newbury the canal joins the canalized section of the River Kennet before reverting back to the Kennet and Avon Canal south of Thatcham at Widmead Lock. There are two timber framed buildings in the centre of Newbury, which were formerly store rooms for traders on the waterways and now houses Newbury District Museum. Between Newbury and Reading is Aldermaston Wharf, where a former canal-man’s cottage is now a British Waterways Visitor Centre with an exhibition about the canal and information on its leisure facilities. On the outer suburbs of Reading, the M4 crosses the Canal near Garston Lock, this is Britain’s last remaining, working turf sided lock, and has been recently restored by British Waterways in conjunction with English Heritage and the local council. The Canal runs for approximately another 6 miles before it joins the River Thames.